My family (7) had the pleasure of staying at Kona Mt. home for 13 nights. The pictures don't do it justice. The view from the lanai is so peaceful with lush beautiful trees, plants, a few goats, a ram, some chickens and the birds are singing all day long. The house was clean, comfortable and the lay out is perfect. Each bedroom is separate and private and all beds were deemed very comfortable. We had the pleasure of using the cottage also and it was perfect for two in our party. We traveled from San Francisco with my 85 yr old father who is 3rd generation from Hilo. The house was laid out perfect for him as well. Easy entry into the house and no stairs to worry about. He had a great time. We decided to stay on the Kona side as we were scared off by the rain in Hilo. The drive to Hilo was a really nice ride with a stop at the volcano and waterfalls on the way. The house had everything you need for a great stay. Towels, snorkeling equipment, water shoes and boards were a great addition to have available. We cooked a lot at the house but also enjoyed some really good restaurants in the area. Fish Hopper, Huggos, Lulu's and Big Hawaiian Grill. We had a special occasion to celebrate and went to the Four Seasons for dinner. It was a really nice meal and the view and sunset were amazing. The Luau at the Royal Kona resort was good. Touristy, but the food was good and the entertainment was enjoyable. My cousin who lives in Kona sent us the magazine, 101 Things to do on the Big Island. It had a lot of great suggestions for things to do in the area. One of the highlights of the trip was the ride to Panalu'u Black sand beach in Naalehu. It was about 2 hrs North on the road to Hilo. It was so beautiful and worth the drive. Turtles swimming all over the shallow swimming areas. So if you are skeptical about staying up the road in the Cloud Forest, be assured this is the best part about the house. When it was 90 degrees in town we always knew we had a short ride up Palani road to a cool, comfortable house. My dad appreciated this. The home, cottage and grounds were incredible. The booking process and communication with the owner was easy and smooth. Standard home and kitchen items were available and in good condition. The location up in the Cloud Forest was calm and quiet -- but easy enough to get down to the coast / town. Around the property there's Mountain Thunder Coffee and some hiking trails. I'd recommend both. There's plenty of beaches, hiking, star gazing, food, and shopping without having to travel very far. We all loved our stay and if we can find the time -- we'll be back! We enjoyed the cool evenings high in the clouds and the warmth of a cozy fireplace to take any morning chill off. The owners have put a lot of thought into making your stay much like home from the very comfortable beds with cozy feather duvets to a well equipped kitchen. Water equipment from kayaks to noodles are provided for your enjoyment. A small but well equipped gym on the lower lever is great for a short work out followed by a soak in the hot tub. If something is missing - just ask and if possible the owners or property manager will do their best to provide it. KMH is quite central to Old Kona or a drive up to Waimea, Waikaloa and even Hilo. The owners readily share with you their favorite places on the Island for snorkeling, best beach and points of interest and invite you to share with them spots you've particularly enjoyed to pass on to future guests. 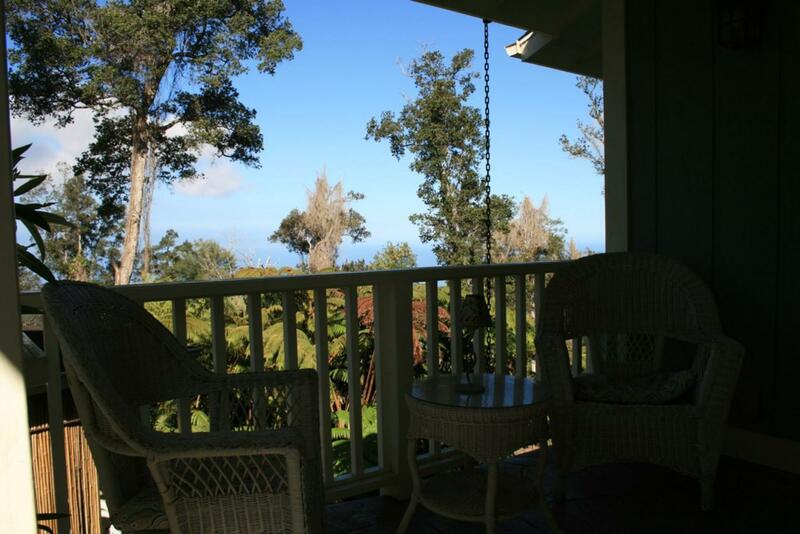 For a home away from home we highly recommend Kona Mountain House. We also stayed in the Ohana, not as comfortable as the main house as it's more rustic and ideal for a short stay. The Ohana is well outfitted and again if you need something not provided all you have to do is ask and if reasonable and possible it will be provided. Laura and her husband do care very much for the well being and comfort of their guests and we would definately recommend KMH for your stay on the Big Island of Hawaii. I stayed at Kona Mountain Home with my family, and the experience was wonderful! The owner, Laura, was very responsive, friendly and helpful throughout the entire trip process -- during booking, the months leading up to the trip, and during our stay. The house itself is great -- it is beautiful, clean, well-maintained, and comfortable. The owners have furnished the home with lots of state-of-the-art appliances, the house has an exercise room, and guests are allowed to use the owners' sporting equipment to go explore the Kona beaches. We truly loved our time at Kona Mountain Home! We really enjoyed staying in this cozy and high end cottage up in the mountains. Laura provided service way beyond our expectations and made sure we had everything needed for our kids ( 4 yrs and 10 months), and more. She was also very helpful with great tips and advice on what to do and see on Big Island. The cottage was immaculately clean, nicely decorated and was equipped with only the best appliances. One could tell that they put a lot of effort and heart into this place! The cottage is located only ten minutes away from Kona, yet it felt like being on the countryside. The kids loved the sheep on the property and we loved the lush surroundings, the view from the lanai and the cool climate. We also enjoyed our visit at the Kona Mountain Thunder Coffee Farm, only minutes away from the property. We highly recommend this place! We absolutely loved our stay at this house. It was great to escape the hustle and bustle of Kona, and to explore the unique environment of the cloud forest. Our group of five (a 4-yr-old, two parents, two grandparents) enjoyed walking around the area on the road and on the nearby hiking trails, hunting for unfamiliar plants and fruits. The house itself is as beautiful and as clean as the pictures indicate. The kitchen is well-stocked with equipment so that we could easily cook dinners, and enjoy every kind of big island fruit we could find at local markets (even avocados from their tree). The owners provide all kinds of beach equipment (towels, coolers, boogie boards, even ice) to make day trips hassle-free. And the house is equipped with everything that all three generations required: fast internet, satellite TV, and a handful of books and toys for kids. We felt comfortable there from the moment we arrived. The owners were amazingly fast to respond to every email or phone call we had at every step of our trip. All together, a wonderful home in a special place. I can't wait to return! Our family had an incredible experience at the Kona Mountain Home. The location of the home exposed our family to the other side of Hawai'i, the cloud forest and mountain. Located just a few minutes away from the heat and bustle of Kona, this is an Oasis. Awesome views add to this beautiful home that comes loaded with all the needed amenities to make the stay very easy. The owners have spent a great deal of time building their dream home and I am so happy they shared their home with our family. Great location, great home and great experience. This gorgeous setting was even more beautiful than described. Everyday we went to a different beach exploring new activities from snorkeling to kayaking - all within an easy drive. Kona had a variety of shops, restaurants, fishing and a market to shop for amazing fruits and vegetables. The nearby trails provided hiking in solitude. The cool mountain setting was a great backdrop as we sat on the lanai watching sunsets, enjoying meals and drinks by the fireplace after a full day on the ocean. The hot tub relaxed our muscles for another day of activities. This home is immaculate with attention to detail making any guest feel pampered. Access to all the equipment for the beach, including the kayaks, made us feel like locals as we explored the island. I would never consider staying anywhere else next time I travel to Hawaii. Mahalo!